Lisnagarvey will meet Monkstown in the Irish Senior Cup final after coming from three goals down to beat Three Rock Rovers 5-4 on penalty strokes. 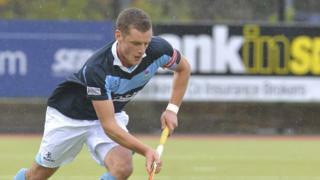 Dublin team Monkstown overcame Tallaght outfit Glenanne 6-2 to book their place in the decider on 20 March. After the game, BBC Sport NI's Nigel Ringland spoke to Garvey captain and Irish international Jonny Bell.